Ed Bolian revealed in his private blog that the new Rambo Lambo SUV will look similar to the BMW X6 and an overall size similar to the Audi Q7. 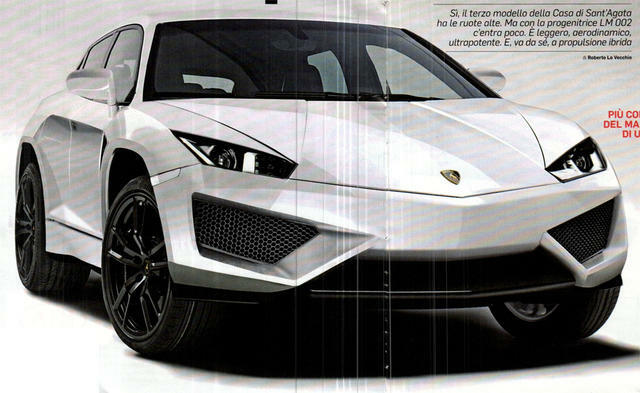 This confirms rumors that Lamborghini SUV VW Group PL71 SUV platform [so as Cayenne and Touareg]. Even though SUV gives a higher stance for the car, Lamborghini’s carbon fiber body kit still gets it lower that you may expect from SUV. Bolian also leaked that front will be Estoque-like, will feature a full LED headlighs. SUV’s rear features trapezoidal quad-exhaust, integrated to the rear diffuser. 24-inch wheels incorporate carbon fiber blades [similar to the ones on Aventador]. Interior should be similar to Lamborghini Sesto Elemento. The possible engine to power up the Lamborghini SUV is 5.2 liter V10 [585 HP].